Jewish Humor Central: A Joke to Start the Week - "The Bank Robbery"
It's Monday in sunny Florida, where we're spending the rest of the winter. It's also Monday wherever you are. And wherever you are, it's time for another Joke to Start the Week. Today's joke is another one from Old Jews Telling Jokes, the gift that keeps on giving. 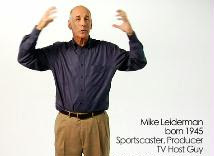 Here's one from their archives, told by Mike Leiderman -- sportscaster, producer, and TV host guy.